Following my thoughts on the evolutionary significance of delayed implantation, Pablo asked the very good question why (if my theory is correct) badgers stopped being solitary and started living in clans. Fortunately, I think I can answer this one. What follows is not my own thinking, but based on the work of Hans Kruuk, a giant of badgerology upon whose shoulders I gratefully stand. His The Social Badger is highly recommended reading for anyone interested in the subject. Kruuk looked at the evolutionary advantages for badgers of living in social groups. Social living is relatively common in mammals. The usual benefit it gives is increased vigilance against predators (think of meerkats or rabbits – one or two individuals can keep watch while the others feed). Social carnivores are more rare. Lions, wolves, dogs and hyenas gain an advantage from hunting in packs – wolves and hyenas, for instance, can bring down prey much larger than themselves by attacking as a group. Badgers don’t fit neatly into this scheme. They are social carnivores but they do not hunt in packs. In fact, for social animals they are actually not very sociable at all. Badgers live together in a sett, and they will play and groom and interact with each other outside the sett, but once they leave the immediate area of the sett they forage as individuals. For most of the time they are above ground they are alone, gaining the advantages of neither mutual vigilance nor pack hunting. So why do they live in clans? Kruuk’s theory is based on defending territory. Badgers, in the UK at least, are omnivores. They predominantly eat earthworms but will happily feed on anything from wheat and barley to rabbits and dead lambs. Kruuk observed that badgers take advantage of different sources of food depending on weather conditions and time of year. Success, for a badger, means making full use of these different ‘food patches’. In order to have a guaranteed supply of food, the badger must have access to a wide enough range of food patches so that if one is not productive there will be others that are. In order to have access to these food patches, the badger needs a large territory. The problem is, a territory large enough to be productive is too large for a single badger to defend. Hence, so the theory goes, badgers join together so that collectively the clan is able to defend a territory large enough to cover sufficient food patches. Each badger plays a part in marking and patrolling the boundaries. This makes perfect sense – many people have found a relationship between the size of badger territories and available food resources. The territories in my fairly lush Bedfordshire landscape of woods, arable and pasture seem to be quite small, reflecting the good supply of available food. Those in more sparse areas (such as Scotland, where Kruuk did a lot of his work) are much larger. The theory accounts for why badgers live in clans today. If my thinking is right, this clan living is a relatively recent evolutionary adaptation. This does raise the question of why it should occur in the comparatively food-rich environment in Britain whilst badgers in other, poorer environments are solitary. One would imagine that the advantage of defending food resources would be more pronounced where the is less food available. Instead, the opposite seems to be the case. Sorry Pablo – the answer to your question ended up a bit longer than I thought. As ever, once I start to think that I understand badgers, I realise that actually I really don’t. Stumbled across your very interesting blog the other day, and I have to say it’s one of the best that I’m following at the moment. 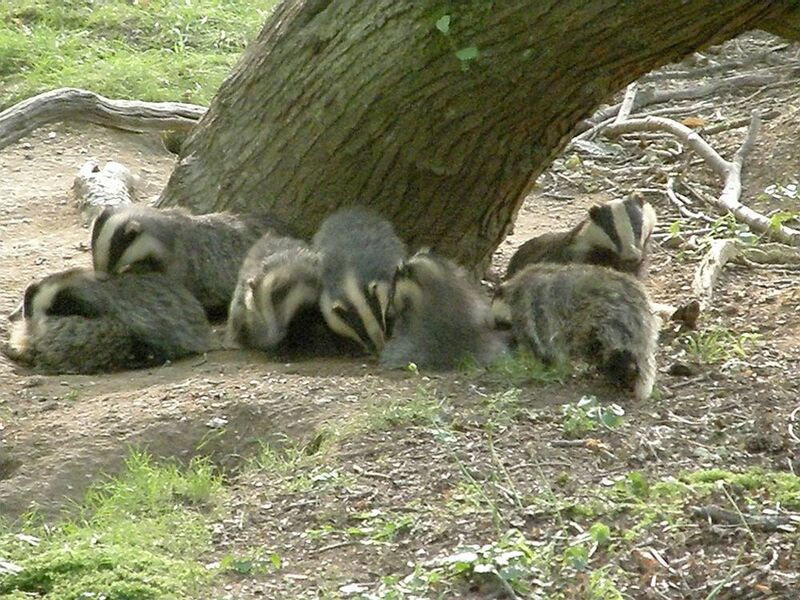 But enough of the gratuities and on with a question, knowing now that badgers live in packs are these family groups or are they built up from other badgers joining from other clans? I ask this because I was curious about how they maintain a healthy gene pool if the pack was solely family orientated or what happens to youngsters that migrate away from the original set (mainly boars I assume). Once again congratulations on an excellent blog and thank you for sharing. Hi John, and thanks. Very interesting blog, by the way – good to hear from a Mirror Dinghy enthusiast! Another good question, and one that fascinates me. In fact, the whole area of inter-clan relationships is fascinating and still a little murky. Fortunately, I can rely on Hans Kruuk for this one too. Badgers need to mate outside their clan, otherwise they’d become hopelessly inbred. It seems that this is accomplished by the male badgers. Young males will leave the sett to seek a mate from another clan. However (and this is the curious part) they will only go to a neighbouring clan, one that borders onto their own. They won’t go two setts away, or three. Only one sett away. I’ll see if I can anticipate the next question. “What determines which male leaves the sett?” The answer is that I don’t know. Badgers have a hierarchy and it is the non-dominant male that leaves. As ever though, it isn’t that simple. It used to be thought that only the dominant male and female badgers mated at the sett, but this doesn’t seem to be the case. I’ve watched two pairs of badgers mate at one time, and at the main sett I watch I’ve seen at least two separate litters of cubs. So, non-dominant males can breed at their home sett, but they can leave. Something determines whether or not they go. I need to re-read The Social Badger and see if Kruuk offers any clues. Glad you liked my humble postings. I’m starting to see a increase in the numbers of ‘road kill’ badgers in my local area (N.E. Wales), although always a sad sight I take it that numbers of badgers are on the up here, (although another answer maybe more movement due to scarce food supplys) It makes me wonder sometimes how something as large as a badger could not be seen in plenty of time by a motorist? Oh in my case Clare migrated 4 miles up the road from Mold to my set in sunny Buckley. It’s a beautiful part of the world, John. I have fond memories (mostly fond, anyway) of the times I’ve walked the Offa’s Dyke path along the Clwyddian hills. As for the badgers, yes, it is a sad truth that many get killed on the roads. There have been a number of large-scale studies and the road deaths do peak in February (and again in September). I’m not sure why. I actually killed a badger last night in my car (even worse because it was on my birthday! ), it was at about 11:30pm, down a 60mph road, when all of a sudden out the bushes a badger dove across the road at such pace, i tried to hit the brakes, i tried to get across as much as i could so i didnt hit anything, but i just couldnt stop in time and knew id hit it. So i went back and checked, and there it was lying in the road. I felt awful, but these things do just happen, its not the badgers fault, i dont necessarily think its my fault, its just the way nature works nowadays. Sorry to hear about your badger. Unfortunately it’s an all too common experience these days. It is estimated that up to 50% of badgers die on the roads. I’ve had similar experiences myself with badgers running in front of my car, and you’re right – they do dash across at the last moment. All I can say is that if the worst does happen and you hit a badger, please do make sure it isn’t left to suffer. Be careful approaching an injured badger – they have a strong bite, but please don’t let it suffer. You can also do the decent thing and move it off the road into the verge. Dead badgers can call unwelcome attention to a sett nearby. I have just found this forum having run a badger over last night. I feel so sad about it but, as has been said, it just emerged out of a ditch on my side of a small country road and ran straight out. I knew that I had hit the side of it’s head but stopped and checked. It had obviously died instantly. I moved it onto the verge – it was surprisingly heavy – talking to it all the time as you do! The thing that has bothered me is that it was a female and the teats were really distended. Obviously I have woken up a few times in the night wondering about cubs(?) and maybe being responsible for the death of not just one badger. On the other hand I was most upset last year when a passing badger disembowelled one of my visiting hedgehogs for a quick snack! I frequently travel from Hampshire to North Devon and the amount of dead badgers on the side of the 303 and 361 is growing. However, it is thought that maybe not all of these are roadkill. It must have been an upsetting event with the badger, but these things do happen. Road deaths are the single largest cause of death for adult badgers in the UK. I’ve heard the rumours that badger baiters dump bodies by the side of the road to try and hide their activities. I don’t believe it. I think the simple truth, whether we want to admit it or not, is that an awful lot of badgers get killed on the roads. If you’re worrying about your badger having cubs, then there shouldn’t be a problem. The cubs will be fairly self-sufficient now. Weaning normally stops by June in badgers. The dry spell may have prolonged things, but there won’t be any dependent cubs at the moment. Earlier in the year, yes, but not now. And thanks for doing the decent thing and moving the body off the road. This is a good thing, for all sorts of reasons. Thanks for making me feel better by saying that any cubs would be almost self sufficient. As you say these things happen but it did make me feel very sad that a life had been extinguished.